Divya, born on 11th January1992 to parents Mahadeva and Susheela in Naganahalli, Mysore had written her II P.U.C Exam and waiting for result. Her aim in life was to look after her parents and keep them happy. They are a family of four members: Her parents, she and her brother. Everything went on well till her father had to face a loss in his earnings through his small field and business. Suddenly, her life took a ‘U’ turn. She could hardly complete her SSLC and had to discontinue her studies moving out for work to help her father to make up the loss in the life. She started earning with a broken heart, regrets and hopeless dreams in her mind. She suffered endlessly with the poorness of her house. The sight of the little girl who dreamt of studying and going to better job was entirely changed and given an opposite look.Her mother also started working in an incense stick company and had to struggle a lot to earn some money, she used to get money for the bundle of sticks she could complete in a day. Life went on with the same speed in a slow recovery of the loss happened in her father’s earnings and business. She could just help her parents make the loss but not fulfill her own dreams which were dumped under the loss in their business. When things were going in such disaster, a friend from her neighborhood recommended her about DB Tech Training Centre to help relieve her from all her worries. She suggested the training would give her skill through which she can fulfill her dreams, and also earn a better living keeping her family happy. Hoping for the positive results and to settle down, she took a decision to join the BASE Programme that offers 3 months skill training in several domains. The programme has been launched by DB Tech in partnership with MoRD. She visited the centre and gave the interest inventory test which decided that she will join the Sales & Marketing course. During the course, she used be attentive and much interested during all the sessions without missing even a single class. Her interest and dedication made her way easier by offering her several options on her path to success. After completing her course successfully, she attended few interviews and finally got selected in PIZZA HUT at a monthly income of Rs. 8,000. Fulfilling her dreams on her own she said, “I am very happy, I feel proud that now I can look after my family on my own, if have finally lived my dreams today”. Her parents are delighted at her success, unable to control their tears they said softly, “It was beyond our expectations that she would achieve this much, but thanks to God and DB Tech, who made it possible”. 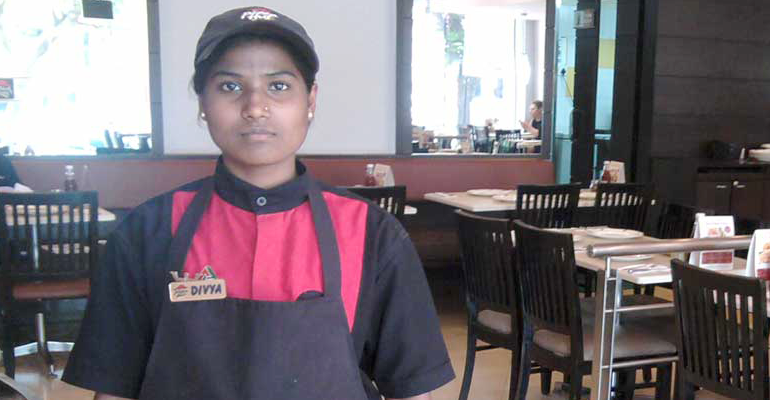 Her manager said, “I can proudly say that Divya is a precious gift given by DB Tech training centre, she offers good service to the customers with the sense of welfare”.